Experience the sights and sounds of downtown Nashville on a guided, 20-minute, horse-drawn carriage ride. Enjoy the clip-clop-clip-clop as one of a wide variety of carriages meanders along Lower Broadway, past the honky-tonk hotspots of Music City. See landmark locations like the Tennessee State Capitol, Cumberland Park, and the Country Music Hall of Fame, just to name a few. Our Nashville Carriage Ride is a great overview of the city for first-time visitors or for anyone simply wanting to ride in style. This exciting, private 20-minute Downtown Nashville carriage ride has all the sites to see in the Music City. 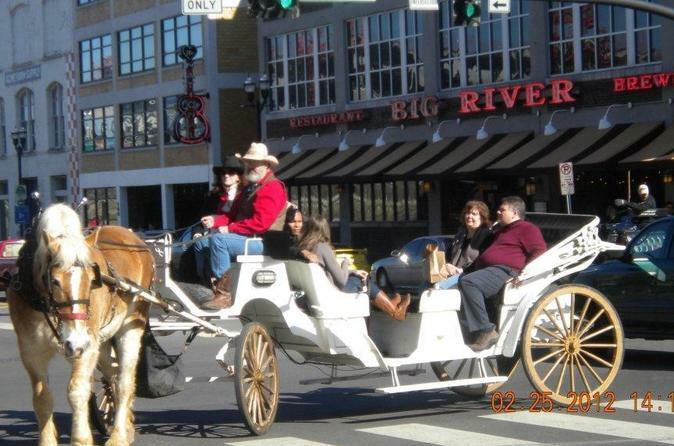 Our carriage ride will provide a quick glimpse of what Nashville has to offer. The carriage tour includes well-known hotspots such as the 5-star Historical Presidential Hotel, the Hermitage, Schermerhorn Symphony Center, the Country Music Hall of Fame, the Johnny Cash Museum, Riverfront Park, the Wild Horse Saloon, as well as the famous Printers Alley, where Jimi Hendrix got his start and became one of the greatest guitarist of all time. While traveling along this great city's streets, pass by the Tennessee State Capitol Building, the War Memorial Building, the Ryman Auditorium, and Tootsies Orchid Lounge, a Nashville country music institution and world-famous honky-tonk venue. This family friendly, fully narrated carriage ride is a great overview and orientation to the Music City.